Hayz... It seems that this site updating is too stressful. It started when I notice that my traffic via Google Analytics are suddenly dropping to 10-20% of my average traffic. Pretty alarming in the sense that it affects my ad sites and the income of my blog. This sudden change started two weeks ago, the time when Google launches its new social networking site called Google+, and with this comes new things from Google including the new algorithm they are implementing and other site related issues. 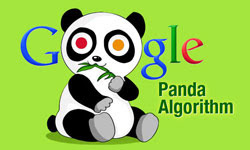 Let's start with the Panda Update, a new algorithm update by the said search engine company, it was my first time to hear this a couple of days ago and has been echoing in the blogosphere for quite sometime. Panda was named after the Google engineer who worked on it, basically what it does is it places high quality content sites to the top of the search list making the page rank higher for them. This is for them to differentiate sites that are doing content farming. As to what is Google's basis for filtering, I'm still trying to figure it out. Still, I'm not sure if this was the cause of my sudden drop.. Of course, I'm not a content farmer, I do my own articles! Also, Panda Update was introduced a few months ago (I think it is March) and during that time my blog is still at its peak. As for the other adjustment, thanks to Kira for the suggestion on my commenting system. Now I'm using disqus to replace my old comment boxes and so far I'm enjoying this. As of now, that would be my report to blog update. I'm still working on my SEO techniques and thanks to all the bloggers out there who are helping me with this stuff.. Blogosphere rocks! Thanks for the comment, though it sounds like a spam. Also, I'm sorry that I have to remove your link since it is not appropriate.. Please understand. Thanks again. I am not an expert in SEO. I am not an expert on anything, except for one to enjoy a cold Blue Moon ice cold glass at the end of each day. There are some things that I try to make every post office I hope it can help search engines find my site. wow.. this CoDotCC is eating most of my time.. !_! thanks for the advise! Bro... New advice... you may removed or retype to "Cc Dot Co" from your post above and in the comments. "Cc dot Co" creates a link in disquss too and this post maybe removed from being crawled too - my attracta analyzer said a warning that it detects links cc dot co in this post. Actually I even check the price of my blog and it really dropped to almost 9X... arrgg.. anyway, thanks for the advise on the domain change..
Hey bro, you did a good decision to make out some changes. I did analyzed your blog from an online software and you have not been indexed from Google of about 3 weeks... (yikes! too bad). I'm using Attracta analyzer and good that you've change the domain... It may not just affects you but also those who are linking to you bro. As a fellow blogger, I'm here to give support you may need. Good luck for this step. Your welcome Kira, I'm always thankful to everyone who helped me. Well it took me a lot of thinking about this sudden drop, and now as a consequence for this change of domain, I would be expecting my traffic to dropped again for sometime... anyway, it's better than the CoDotCC issue which will eventually lead to more serious case..
Hi AJ, Thanks for mentioning me here. I really appreciate it a LOT! I am glad that you found the cause of your dropped traffic. Google banned millions of CoDotCC domains and if you wanna test it in the search, you cannot find CoDotCC anymore. I also shared this news to some blogger friends out there and they immediately did something in their blogs.